The following is an address delivered by Deputy Premier of Nevis and Minister of Health Hon. 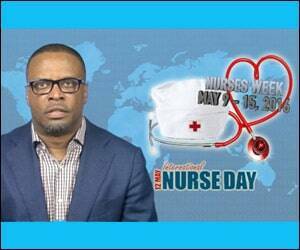 Mark Brantley on May 09, 2016, to launch Nurses Week 2016. Nurses’ Week 2016 will be commemorated this year under the theme “Nurses: A Force For Change: Improving Health Systems’ Resilience”Â. The week which will run from May 09 to 15, 2016, will examine the role of nurses as part of the health system, to enable it to effectively respond, adapt, and strengthen its capacity to perform when exposed to challenges including but not limited to, disease outbreaks and natural disasters. Historically, nurses have contributed to public health successes including a reduction in maternal and infant mortality, through the use of a number of strategies including the implementation of a successful vaccination programme. In fact, just a few short weeks ago, “Vaccination Week in the Americas”Â, was hosted by the Community Health Nursing Department to promote the importance of vaccinations. In addition to their work in the prevention of communicable diseases, nurses are actively involved in the prevention, care and treatment of Non-Communicable Diseases (NCD), which has contributed to increased life expectancy. These diseases represent our greatest burden of disease, as such, community health nurses focus on the prevention of NCDs through health promotion strategies. Disease management tools are also provided through Diabetic and Hypertensive Clinics which are attached to all health centers. With over 500 persons on each of these registers, it is essential that trained personnel are available to manage these programmes. I take the opportunity to applaud the nurses who work at the six health centers on Nevis and also those who work at the Alexandra Hospital who, through their efforts, have not only made the health system resilient but the economy as well, as a nation’s health determines its wealth. The management of NCDs and sustaining the health gains attained through the “Expanded Program on Immunization”Â, represent part of the Sustainable Development Goals (SDGs) which addresses healthy lives and the promotion of well-being for all ages. Of critical importance also, is the role of nurses in the advancement of health technology. This is particularly important as we strengthen data collection to enhance quality care. In this vein, nurses have been trained in the operations of the soon to be implemented electronic hospital information system. As we further examine our health data, which depicts an increase in intentional and unintentional injuries including road accidents, we also recognize the importance of introducing new services at the Alexandra Hospital. In this vein, we applaud the nurses who recently formed part of the inaugural neurosurgical team which will not only benefit those injured in road accidents but others as well. Other SDGs also relate to health including those of nutrition, clean water and gender equality. It is therefore imperative, that adequate human resources in the right mix are available to successfully accomplish the sustainable development agenda by 2030. As such, the training of nurses and other professionals including nursing assistants, attendants, community health workers, and emergency medical technicians, will remain a priority for the Nevis Island Administration (NIA). Training opportunities for all of these careers are available right here in the Federation. I implore young people to take advantage of the opportunity to be a part of this rewarding profession. In-service training is also a requirement for nursing professionals with training sessions conducted weekly. This week will be no exception, with a symposium scheduled for May 11th centered around the theme. Our human resources for health strategy, also includes the recruitment of young persons into the profession. As such, the week of activities will also include visits to various schools around the island. A resilient health system not only ensures universal access to health workers but ensures that policies are in place to guarantee that services are available, accessible, acceptable and of good quality. As we move towards the realization of universal health insurance, we commend nurses for not only providing clinical skill but also being a part of legislation and policy development. Nurses have been leaders in the development and revision of the Nurses and Midwives Act, as well as various other health legislation. The contribution of nurses will continue to be critical to health systems development. As nurses celebrate this week in recognition of the birthday the “motherÃ¢â‚¬Â of nursing, Florence Nightingale, on May 12th, I encourage the general public to reflect on the health achievements attributed to nurses and ask you to support nursing professionals, not only during this week but always. I officially declare Nurses Week open.